Two blissful hours of serenity and relaxation. 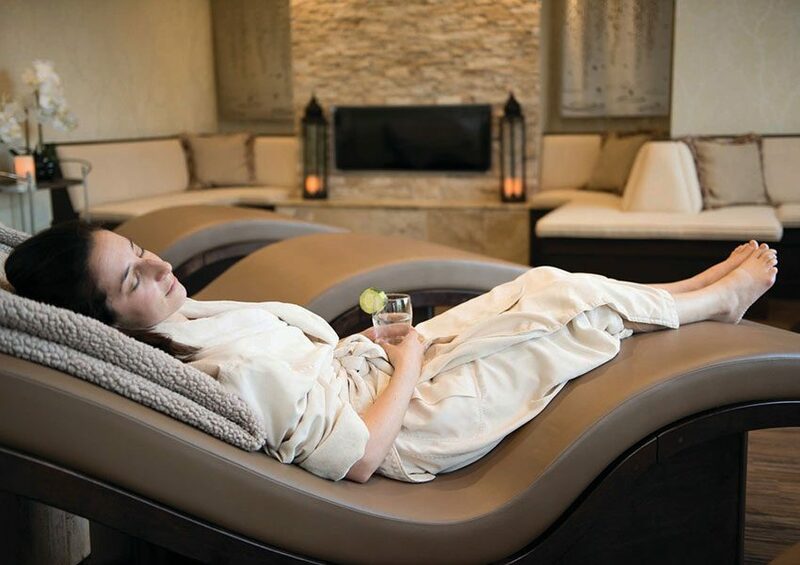 It’s more than a respite; a spa visit is a spiritual and physical rejuvenation—and welcome escape from daily demands that can take their toll. When I heard about the Custom Two-Hour Time Journey spa experience at Complexions Spa for Beauty & Wellness, it seemed made for someone like me, a busy woman with a “monkey mind” who needs serene surroundings and more than an hour to wind down. On the day of my appointment, I was welcomed by friendly faces but not the pretention that sometimes accompanies high-end spas. After changing into a fluffy oversized robe and some sandals, I wandered into the Relaxation Lounge to await my massage. I was quite content to munch on the complimentary tropical trail mix, sip coconut/lemon water and recline in an ergonomically correct chaise lounge; but, too soon, my lovely therapist Evelyn arrived to guide me to the massage room. To begin, I stepped into a shallow bowl of warm Saratoga mineral water mixed with salt, an experience that helps people transition from a world of stimulation to the candlelit spa room. As my feet soaked in the water, piped directly from Saratoga’s famed mineral springs, Evelyn had me inhale essential oil combinations, which are formulated by Complexions. I chose a blend of lavender, peppermint and arnica. The first treatment was a full-body sea-salt scrub. As I laid on the heated massage table, Evelyn exfoliated and refreshed my skin. Once this cleansing was complete and the salt wiped away with a warm towel, Evelyn started my massage with shea butter and my selected essential oil blend. After the 50-minute massage, I had the choice of an extended body massage or moving to a cleansing facial. I opted for the facial, which started with a sweet lupine cleanser followed by an cleansing facial polish enriched with aloe, rosemary, jojoba and oat flour. Evelyn then applied a small amount of a soothing carrot seed facial oil to calm and hydrate my skin before applying an aloe replenishing mask. While the mask, infused with black currant extract, pear and olive, worked its magic on my skin, it was time for my favorite part – the 10-minute scalp massage. By this point, I was so relaxed I could have melted into the massage table. Finally, the mask was removed with a warm towel, and the facial was finished with a beech tree moisturizer highlighted with orange peel and ginseng to both energize and quench my skin. The journey was complete, and I left the room feeling calm and rejuvenated. In today’s fast-paced, electronic world, we all need and deserve some offline time to recuperate and reconnect our minds and bodies. Complexions offers just the right escape, and the Time Journey is an excellent option for a more customized experience. I can’t wait to go back!